I’ve tried a lot of over-rated Christmas cookies over the years. This is not one of them. These cookies are amazing, and are quickly becoming a holiday favorite around here. You do have to stir the pomegranate arils into the batter very carefully, so you don’t turn it pink. I also don’t recommend doubling this recipe, as good as it is, because the pomegranate juices tend to seep into the dough the longer it sits. If you’re really worried about this, you can keep the pomegranate arils separate from the cookies, and tuck 6-8 arils into each cookie individually. I didn’t do this, and my cookies still turned out beautiful and tasty. And if you’re looking for a great way to peel a pomegranate, I recommend the underwater method. In the bowl of a stand mixer, cream butter and sugars together until smooth. In a separate bowl whisk together flour, baking powder, baking soda, and salt. Slowly add flour mixture to the wet ingredients. Mix until just incorporated. Stir in the oats and white chocolate chunks. 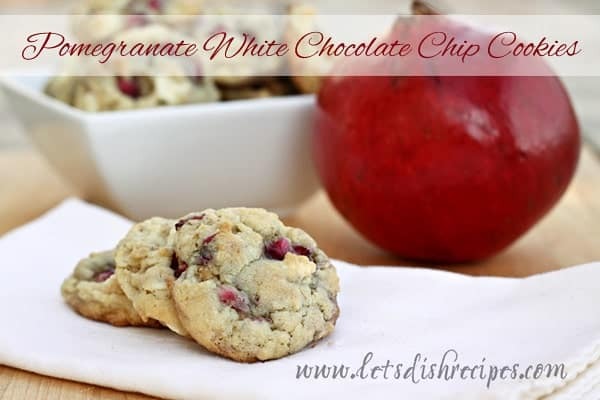 Toss the pomegranate arils with 1 tablespoon of flour. Very gently (I used my hands) stir the pomegranate arils into the batter. Remove from oven and let cool on baking sheet for two minutes. Transfer to a wire rack to finish cooling. Who Dished It Up First: Adapted from Two Peas and Their Pod. This is a cookie with a twist for sure. Love it with the pomegranate and will have to try it. Thanks! 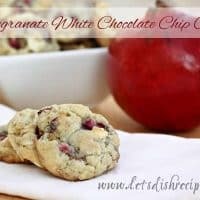 I’ve never used pomegranate before but these look delish! Perfect use of the pom! It’s a great idea for the holidays! Wow this is such a unique holiday cookie idea… it sounds great. no wonder it’s a favorite in your house! I used this cookie for a cookie party this holiday season and WON! Best cookies ever! Just a little moist so don’t stack them right away.